I love helping others, and the fact that this will basically be effortless (I eat pretty much everyday) means I have no excuse to round up all my friends (That means YOU!) and get out there to support this year's Dining Out for Life event. 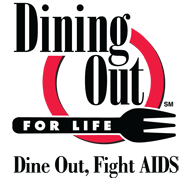 Since 1990, Dining Out for Life has offered an easy and delicious way to raise money to fund critically-needed services for people with HIV/AIDS. On Thursday, April 26, 2012, participating restaurants around the country will donate a portion of all sales to local AIDS service organizations. This year, more than 250,000 people are expected to dine out in one of the more than 3,000 participating restaurants in 62 cities and raise at least $3 million for 60 AIDS service organizations around the country. Here in Boston, participating restaurants will donate 25 percent of sales of meals to AIDS Action Committee. · Be a Host. Help fill a restaurant by recruiting 25 to 30 friends, family, and colleagues to dine out and spend the evening greeting them, thanking them for participating, and encouraging them to make a personal donation. · Captain a Table. Bring a party of 10 or more to one of the participating restaurants and encourage them to make individual donations. · Spread the Word. "Like" Dining Out For Life on Facebook.com/Dine4LifeBos, follow @Dine4LifeBos on Twitter and use the hashtag #DOFL. · Dine Out. Make plans to eat out on Thursday, April 26! Cilck (here) for more info. 0 Response to "Dining Out for Life - 4/26"